The Beurs van Berlage has been an international hotspot full of charm since 1903. The place to be in the heart of Amsterdam, where special things happen on a daily basis. A city trip is simply not complete without a visit to this building that seamlessly combines history and current affairs. Whether you enjoy a tasty lunch at Bistro Berlage, participate in an exciting Sherlocked escape room or visit an inspiring event, there’s always something going on in the Beurs. Tickets Want to order tickets or make a reservation? 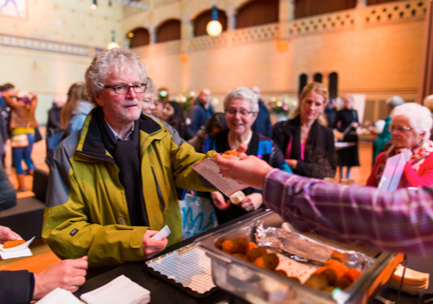 Would you like to visit the bustling Beurs van Berlage? This is where you can order tickets, make a reservation and learn more about all our activities. For a successful day out, try a combination of our activities and facilities. For example, a cozy drink in Bistro Berlage after an escape room or a delicious piece of Tony Chocolonely chocolate prior to an exhibition. Sounds good right? Do you want to know the easiest and fastest way to reach Damrak 243? We’re happy to show you the way! The Beurs is easy to reach, both by car and public transport. The metro, trams and the train station (Amsterdam Central Station) are all within five minutes walking distance from the Beurs. Do you want to know the easiest and fastest way to reach Damrak 243? We’re happy to show you the way! The Beurs is easy to reach, both by car and public transport. There are also many parking garages nearby, including Parking Centrum Oosterdok (nine minutes walking distance) and Q-park parking garage De Bijenkorf (next to the Beurs van Berlage). Amsterdam Conference Center Beurs van Berlage is located in the center of Amsterdam on Damrak, Oude Brugsteeg and Beursstraat, directly opposite the central station, a short distance from highways and Schiphol Airport. The Beurs van Berlage is extremely easy to reach, both by public transport and by private transport. The Central Station is a stone’s throw away and in the vicinity of the Beurs there are a number of large parking garages such as Q-park de Bijenkorf and Parking Centrum Oosterdok. Due to the many activities in the city center, the approach routes to the Beurs van Berlage are constantly changing. We try to provide you with the most recent information via the PDF below.